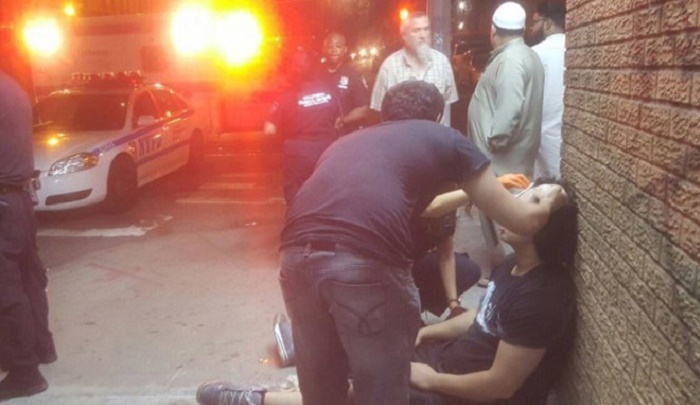 The case of two Muslim teens who were beaten to a pulp outside a Brooklyn mosque was originally investigated as a hate crime. But now Brooklyn’s DA office is investigating the possibility that the boys may have sexually assaulted the man’s (Christopher Vallaro) girlfriend, before he came to her rescue. While the investigation is ongoing, fake hate crimes have long been big in the “Islamophobia” business: Robert Spencer wrote about 2014’s top anti-Muslim hate crime hoaxes, and the mass media is always in a hurry to jump to report them without any evidence. Vallaro’s defense attorney said he’s “glad that the District Attorney’s office is taking a look at the entirety of the situation, and not just what the alleged victims said happened”. Shouldn’t all law-abiding citizens be glad? It is absurd that a hate crime was immediately assumed to have taken place on the word of the two Muslim victims before any investigation. The Brooklyn DA’s office is investigating allegations that the two teens beaten to a pulp by an enraged boyfriend outside a Brooklyn Mosque were​ ​sexually assaulting his girlfriend, The Post has learned. But investigators with the DA’s office have scheduled a meeting with Vallaro and his girlfriend to look into the accusations that the teens reached through the car window and groped her breasts and body, sources said​. Vallaro ​came to her rescue when he heard her screaming for help from floors above in his apartment, which is located adjacent to the Sunset Park mosque. During a brief Wednesday appearance, defense attorney Sal Strazzullo submitted 20 letters from his client’s neighbors, mostly Muslim-Americans, in Vallaro’s defense. “I’m glad that the District Attorney’s office is taking a look at the entirely of the situation, and not just what the alleged victims said happened,” Strazzullo said. Vallaro declined comment as he left court.